Any whale in captivity is an absolute tragedy, but this theme park in particular is one of the worst places for them. Home to Morgan the suicidal whale, Loro Parque also homes Keto who has been eating paint chips out of depression and boredom and to self harm. This park must close now and the orcas released to a sanctuary right away. Will you sign on to help make it happen? Orcas are incredibly smart animals, they do not belong in tiny enclosures with nothing to do. In captivity, they become depressed and start self harming, like when Morgan beached herself in a suicide attempt. Now, Keto is following suit. He's so down that he is eating toxic paint chips from his barren enclosure because he lacks brain stimulation. Keto has even killed a trainer before because he is meant to be a wild animal, not a toy who lives by the whim of humans and has none of the things he needs to be happy. It's tragic that a person died, but it's just more evidence that orcas do not belong in captivity. Now he has to have a medical procedure called an endoscopy and the video of 7 trainers trying to force him in complicity is heartbreaking given that it's their fault he has a health problem. 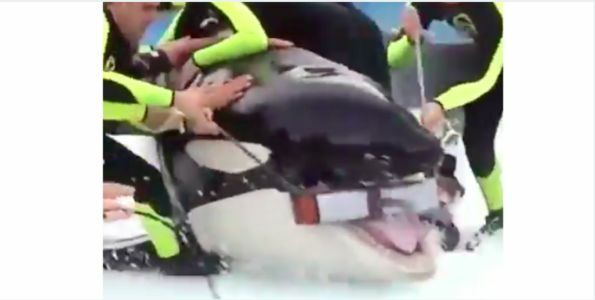 Orcas are not entertainment. Sign on if you want to see this gross park closed down for good and all their animals sent to sanctuaries where they can live fuller, happier lives.